See a bold German booklet. Look at the roughly contemporary (1968) "Educational Portfolio on Menstrual Hygiene" from Modess - See an earlier teacher's kit, early 1950s. Complete list of kits and booklets from companies about puberty. See also the booklets How shall I tell my daughter? (Modess, various dates), Growing up and liking it (Modess, various dates), and Marjorie May's Twelfth Birthday (Kotex, 1928). 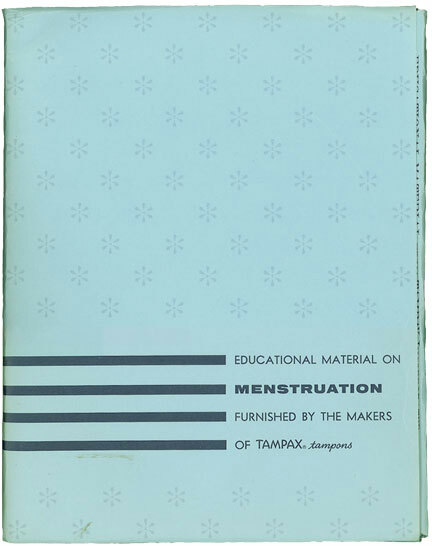 "Educational Material on Menstruation Furnished by the Makers of Tampax" (1966) U.S.A. This kit in a folder contains studies and more technical material than in teacher's kits like the 1968 Modess kit and others in the museum (complete list, also of booklets). Starting probably in the late 1940s, companies like Modess, Kotex, Pursettes, Tampax made, and sometimes still make, kits for schools, enabling teachers to use the material to explain menstruation and puberty to American girls - today, sometimes also to boys - and let the captive audience see their products, hoping they will use them for life; they often did. Sometimes the companies also supplied films, such as the famous one from Walt Disney. I thank a Texan for this great Christmas present! Below: The cover of the 8.5 x 11" (21.5 x 28 cm) folder. The back of the folder is blank but the same color. Growing up and liking it (Modess, various dates), and Marjorie May's Twelfth Birthday (Kotex, 1928). See another ad for As One Girl to Another (1942), and the booklet itself. site in any manner or medium without written permission of the author.